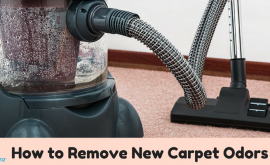 HomeRemove Chemical Odors & VOCsWhat is the History of Toxic Mold? Toxic mold syndrome refers to a condition where one has been exposed to harmful mycotoxins produced by molds, which are a type of fungi that grow in moist and improperly ventilated areas. 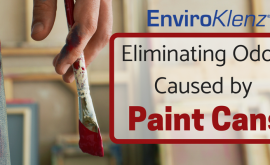 Prolonged exposure to these toxins could lead to physical impairment and possibly death. When Were Toxic Molds Discovered? Toxic molds are an ancient thing, dating as far back as biblical times. They would grow on stones inside or outside houses and were a feared sight. Once discovered in or outside a house, the stones on which they grew would be taken and thrown outside the city. Sometimes, the dismantling of a house would occur to get rid of the stone. Its occupants also had to clean themselves for fear of contaminating other things or people around. Coming to the 19th century, a mold was discovered by a mycologist known as Carl Joseph Corda. He found it growing in a house in the capital city of Czech Republic. 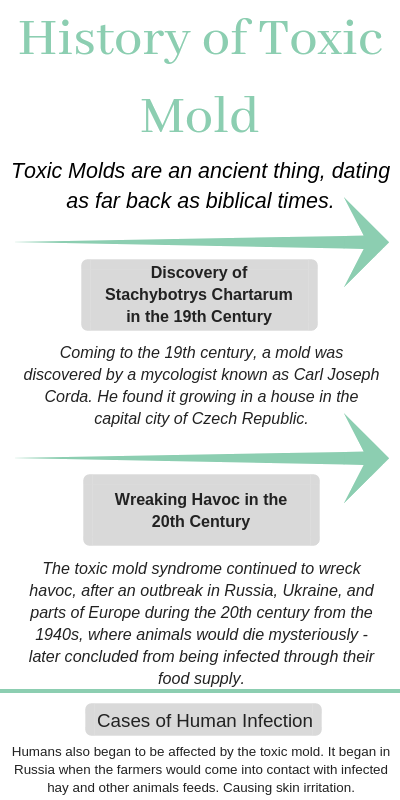 According to Carl, it was a greenish black mould which he called Stachybotrys chartarum. The toxic mold syndrome continued to wreck havoc, after an outbreak in Russia, Ukraine, and parts of Europe during the 20th century from the 1940s, where animals would die mysteriously. The animals were later discovered to have been infected with the toxic mold by eating wet infected feeds. The most affected were horses. From the cases of animal, especially horses infection, humans also began to be affected by the toxic mold. It began in Russia when the farmers would come into contact with infected hay and other animal feeds. This would cause skin irritations and inflammation. Further, if the moulds found their way into their food, they would experience nausea, severe vomiting and diarrhea. Previously, most toxic molds were found outdoors. However, in the 1970s, molds started to be a common peril even indoors. Houses that were build with airtight designs were affected by the molds which quickly thrive in poorly aerated moist conditions. Moreover, use of poor quality of construction materials that easily absorbed moisture, provided a medium for the molds to thrive, further increasing their danger to humans. It was in the 1980s when the effects of the toxic mold growing indoors became rampant. In many cases, the symptoms including skin irritations, diarrhoea, and flu, would affect a whole family. Upon investigation, toxic mold would be found in the house. 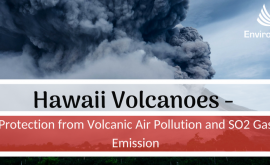 Causes would include improper aeration and too much dumping in the houses causing the building materials to soak and provide growth condition for the molds. Upon removal of the toxic mold, normalcy would return to the house occupants. Between 1991-1995 when the toxic mild syndrome caught public attention after a flooding that occured in Ohio, causing serious illness of over 20 children as well as several deaths, toxic mild syndrome was found to be at the core. 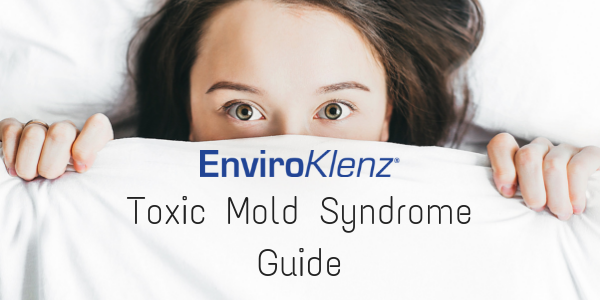 For further information, read our toxic mold syndrome guide. It seems like toxic mold syndrome is here to stay as long as flooding, poor aeration, and general unhygenic conditions remain the order of our world today. 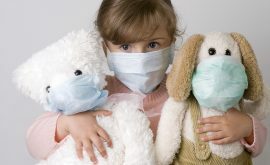 Cases of deaths have been reported as recently as in 2001 with reports stating that in America, over 500,000 people die each year because of toxic mold syndrome. There is now need to put safety measures in buildings and during flooding to prevent molds which have and continue to have devastating effects on people today.